British entrepreneur Richard Branson has joined the rush into the internet music arena. He has launched a Virgin Digital music store in the US, offering tracks for 99 cents (55p) and subscription options. He plans to extend the service beyond the US, but no dates have so far been announced. Jupiter Research expects the online music market in the US to grow from around $100m (£55.5m) in 2003 to $1.7bn (£945m) in 2009. The past year has seen a raft of music services launched in both the US and the UK. Companies such as Microsoft, Sony, RealNetworks and Coca-Cola have all set up online music stalls. 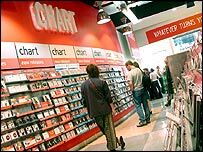 In the UK, the music chain HMV already offers an online music store. But Virgin is confident that it can carve out a place in this crammed marketplace. "We don't see this as crowded," said Zack Zalon, president of Virgin Digital. "It's not saturated at all and there is tremendous growth potential," he told the Reuters news agency. "We plan to be a significant player in five years." The Virgin service, which can only be accessed via a Windows PC, has more than a million tracks. People can download the songs for 99 cents, which they can play, burn to a CD or transfer to a digital music player. It also provides a monthly subscription service for $7.99 (£4.40) a month, which allows people to listen to more than 100,000 albums online. So far, online stores that offer tracks for download like iTunes have proved far more popular than subscription services like RealNetworks' Rhapsody . Virgin plans to promote the service through its presence on the High Street, as well as through other parts of the group. "There's a goldrush mentality in the music download market at the moment," said Tom Dunmore, editor of the music magazine Rip & Burn. "But the virtual High Street will soon have a familiar look, with a handful of big-name megastores and a number of specialist download sites. "That said, Virgin is a strong brand that is more likely to appeal to style-conscious music fans than online stores run by the likes of Microsoft or Wal-Mart."